A brite tank (also known as a bright tank, bright beer tank, etc.) 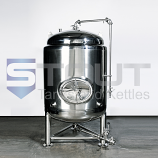 is used for carbonation of beer, as a tax determination tank, and as a serving tank. Our bright beer tanks are ideal for micro breweries and nano breweries where space may be limited. 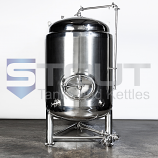 These brite tanks can be used for storing and serving carbonated beer and eliminate the hassle of cleaning beer kegs. Like all of our products, we only use sanitary fittings and hardware. See below for details. Many sizes are possible, if you don't see the size you want, please contact us with your needs. Our brite beer tank comes with a sight glass for determining the volume of beer in the tank. This is accomplished by providing a valve and hose barb at the bottom of the tank and a hose barb at the top of the tank. Using pressure rated clear beer tubing (not included), you can measure the volume in the tank. In most areas, this will allow you to use this as a tax determination tank. Please check with your local regulatory offices if you want to use this as your tax determination tank.